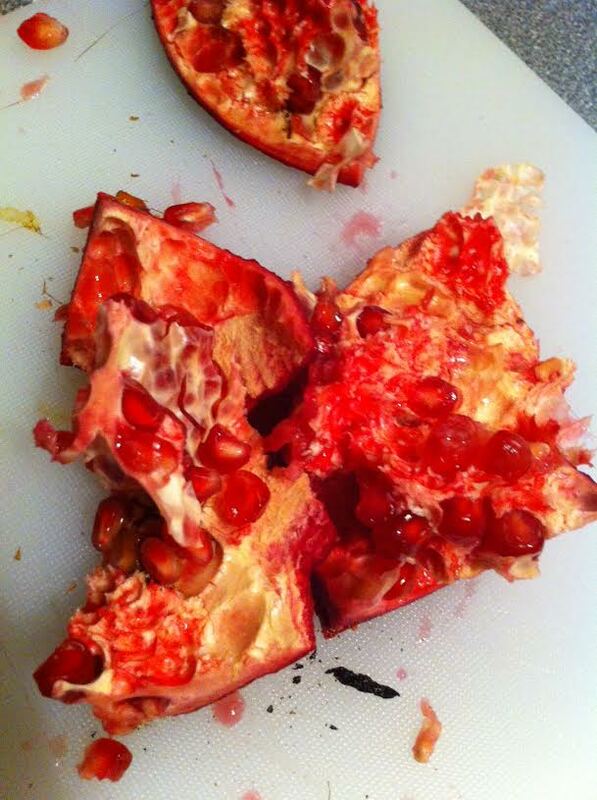 I had never had a pomegranate before, and if you haven’t yet, try it soon! Pomegranate seeds – which are the part of the fruit we are meant to eat – are the most unusual little morsels. They are the same heft as any other fruit seed, but when you bite into one it is like a little explosion, a ‘pop’ if you will, and its like the sweet seed was filled with little more than a tasty puff of air. Combined with the satiny texture of the sweet potato (or yam, technically), the combination of sensations was more pleasant than I could have imagined. Yesterday my brother put together a sweet delight that when described to me sounded a little odd, but that turned out to be heaven on a plate. Two yams baked at 400 for about an hour, split open and drizzled with coconut milk, one perfectly ripe pomegranate sliced into quarters and cleared of those yummy little seeds mentioned above, and a sprinkling of coconut flakes made a meal that was part dessert, part stick of nutritional dynamite.